Hello Parokeets and all other sorts of colorful little parrots, who like to read this blog! I would like to present my favorite nail polish to you. It’s Nfu-Oh No. 64. My favorite nail polish and the front of the bottle. Isn’t this rainbow just gorgeous? Photo was taken indoors under artificial light with flash. This polish is really amazing to me. What I like the most is the holographic effect, which almost blinds me every time I look at it. The rainbow is the most visible on the sun, but it still glows in shadow or indoors. I think it isn’t visible only in the darkness. :) The bottle is beautiful too, it looks like a dress and the cap looks like a corset above it. It contains generous amount of polish – 17 ml. The definition of this colour was a lot of trouble for me. On the nails you actually can’t see it, because it is very shy and hidden under the rainbow. That’s why the real shade was a secret to me until I became an owner of matte nail polish. When I painted it above the Nfu-Oh 64 it showed its actual colour, because it killed the multicoloured shimmer. I still don’t know how to describe the base colour, to me it looks like lavender with a touch of pink. You can see it on the photo below. Matte middle and little finger on daylight. What a surprise! My favourite nail polish, but with just average base colour. And despite of all it is still the one, which draws me to look at my nails more times than all other polishes I own! In the element. :) Photo was taken in cloudy weather. Next articleHaving fun with skittles! :shock: I would never have know what the base color was! 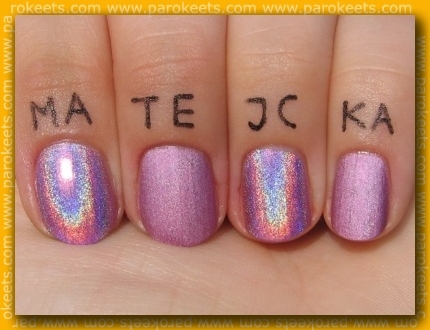 I’ll have to try that with other holo’s. It sure does look like an orchid maybe. It is really a gorgeous holo! Nati, tele mavrice so pa tako – človeka čisto zasvojijo. :silly: Govorim iz lastnih izkušenj, ampak je pa res, da zagotovo nekoga drugega sploh ne ganejo. Smo si pač različni. :biggrin: So pa laki te firme najbolj holografski, vsi drugi v moji zbirki so veliko manj. Tako da ti mogoče svetujem, da za začetek ne kupiš ravno tega lakca.